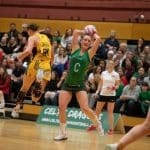 It was a frantic and scrappy first quarter for both sides at the Sport Wales National Centre as Celtic Dragons took on London Pulse in Round 11. Dragons, looking to bag their first home win of 2019 were aiming to replicate their thumping 67-40 win at the Copperbox earlier in the season. They started very positively, turning over Pulse’s first centre pass and building a solid lead. Dragons were able to plunder Pulse’s ball at will, although they weren’t quite clinical enough as the quarter went on. There was drama as the visitor’s Fionnuala Toner took a crashing fall as she made contact with Stacian Facey, but, unlike the Pulse scoreline, she was no worse off for the collision. There was a step change in the second period as Dragons settled down and became the more clinical of the two sides. However, a few flat spots and the visitors were able to creep back into the match, thanks in large part to the vision of Bea Skingsley. Dragons took their chances well, but Pulse’s Shantal Slater was able to hit the target with far more consistency and this helped them take the quarter by 2 and set up an intriguing second half. The match tightened up as the third quarter got underway. Both sides were tidier off their centre pass and this gave Chelsea Lewis the platform she needed to keep the scoreboard ticking over. Bethan Dyke continued to build on her seasonal re-appearance at wing attack with a solid performance off the bench. Though Pulse took advantage of some of Dragons’ errors, it was the home team that finished with a flourish, scoring 5 unanswered goals in the final couple of minutes. In the final period, Dragons were able to turn on the flair and they started to pull away from the visiting side. A first home game of the season was in the bag, but Stacian bagged herself a late trip to the bin, leaving Abby Tyrrell to keep the goal on her own as Pulse scored some consolatory goals. 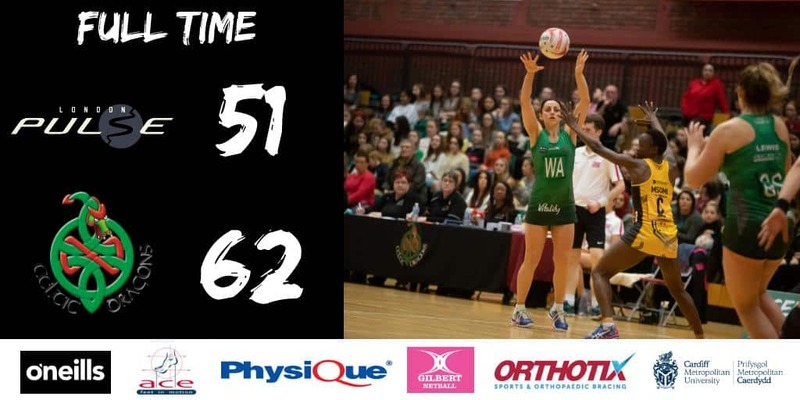 The result sees Celtic Dragons rise to 7th in the league table with 12 points to their name. The team now faces a short turnaround to their next home game: a Round 12 encounter with Severn Stars at 4pm on Saturday 30 March. 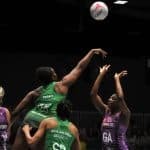 Celtic Dragons: C Lewis, K McCollin, S Drane, K Jones, N Jones (Capt), D Bolakoro and S Facey. Replacements: B Dyke, A Tyrrell, L Herdman, L Howells and E Nawele. The Celtic Dragons are one of the 10 UK teams that take part in the Netball Super League. As the only Welsh team in this prestigious league, the Dragons combine the finest players from all over Wales with a mix of international talent blended into the group.